- Added support for the iPhone 6 and iPhone 6 Plus. Timers are now automatically detected in your directions. Simply tap on one to start a new timer. We display the most recent timer countdown in the toolbar. Browser clipboard tools have been added on iPhone! We've redesigned the clipboard tools to make them easier to use. When you import a recipe from a website, the recipe is copied to the clipboard tools, to allow you to make adjustments before you save the recipe. The add meal button now uses a step-by-step wizard, which walks you through each step of adding a meal (choosing a recipe/date/type). When choosing a date, we show a monthly calendar that lets you see which means you have already planned. 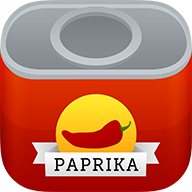 We're very proud of this update, as this is easily the best version of Paprika we have ever released. We have been cooking with it in the kitchen and hope you guys love it as much as we do. Best of all, this update is completely free! Thanks for all of your patience and support, and stay tuned for more. Fixed bug where you can't select the meal type when adding meals on an iPhone 5. Fixed bug where recipe directions run wider than the screen. Fixed potential crash when editing a recipe's prep time or cook time. Better checkbox positioning when grocery list items have long titles. You can now tap on a grocery list item to see more information about it, including: the recipe it came from, whether it was consolidated, and if so, what the original ingredients were. Changed status bar to black. Re-added Clear Purchased button to grocery list. Fixed problems with missing meals when emailing meal plans. Fixed load URL from clipboard crash. Added a search bar to the browser screen. Fixed upside-down date picker issue. Fixed issue with broken category navigation bar. Fixed bug that could cause notes and nutritional information to be lost when editing a recipe. Minor bug fix for weekday ordering in certain locales. Minor bug fix when syncing new grocery list items.